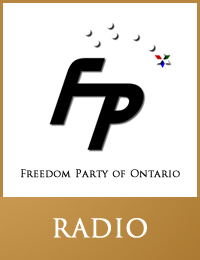 On May 31, 2018, Tom McConnell (radio 610 CKTB AM / 1290 CJBK AM ) interviewed Freedom Party leader Paul McKeever in the run-up to Ontario’s June 7, 2018 provincial election. Among the questions McKeever was asked (and answered) were: Does FP have a costed platform? ; What would you do about electricity in this province? ; What about energy conservation programs? ; Would you give a discount now and make consumers pay more later? ; End the ban on incandescent lightbulbs? ; What would your plans be for health care? ; Is there anything in your platform re: mental health and addiction? ; What would you do about the Beer Store, LCBO, and the proposed Ontario government pot-dealing monopoly? ; Is there any agency, board, or commission that you would get rid of? ; How many candidates are you running in this election? ; Why aren’t you Freedom Party people under the PC banner, trying to effect change from within that party? ; Would you re-write the Green Energy Act so that Ontario doesn’t pay more for electricity that Ontario sells it for? ; Is the difference between the Freedom Party and the Libertarian party? ; What are some of the other things in Freedom Party’s platform that you’d like people to be aware of (McKeever touches on issues such instruction in schools; policing and public safety at university speaking events; due process vs. workplace investigations)? ; What is your party’s realistic goal in this election? ; Would you be in favour of proportional representation? 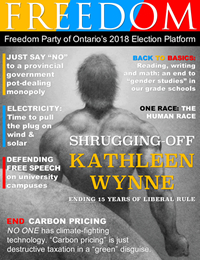 On the May 31, 2018 episode of Just Right, Freedom Party leader Paul McKeever and Just Right host (and Freedom Party of Ontario president/CFO) Robert Metz discussed the coming, June 7, 2018 Ontario provincial election, and how the Ontario PC Party has essentially consisted of echoing Liberal spending promises, refusing to balance the budget, and refusing to address serious social issues. In other words: they are alienating both fiscal conservatives and social conservatives, hoping that people will vote not for ideas, but for a party with a name that just happens to have the word “conservative” in it. Regular listeners to Just Right will recognize the voice of Andrew Lawton (in one of the audio clips used in the episode) speaking at a Freedom Party of Ontario dinner in 2013 about his journey from associating with a party devoid of pro-freedom ideas (the Progressive Conservative Party of Ontario) to a party that has and promotes the right ideas and policies. Lawton praises the courage of those who run for Freedom Party because it takes more courage to do that than to run with a bigger party devoid of pro-freedom ideas. Five years later, Lawton agreed – for the 2018 provincial election – to be the Progressive Conservative Party candidate for the riding of London West. McKeever and Metz discuss integrity. On May 24, 2018, Freedom Party leader Paul McKeever was a guest of the Craig Needles Show (AM980, London, Ontario). Needles asked McKeever about Freedom Party’s election platform, including he party’s positions on balancing the budget, and on health care, electricity (unplugging wind and solar contracts), education (experiential learning and gender studies), London, Ontario’s Bus Rapid Transit (“BRT”) plan (McKeever and FP oppose provincial funding for it and oppose the plan itself) and more. On March 1, 2018, the Andrew Lawton Show (AM980, London, Ontario) hosted a debate involving three of the four candidates for the leadership of the Ontario PC Party: Tanya Granic-Allen, Doug Ford, and Christine Elliott (Caroline Mulroney declined her invitation). On March 2, 2018, Lawton had representatives from two other political parties on his show to discuss the issue of how the three candidates had performed on the debate: the Ontario Liberal Party’s Deb Matthews (MPP for the riding of London North Centre and former Deputy Premier of Ontario) followed by Freedom Party leader Paul McKeever. In his interview with McKeever, Lawton canvassed a number of issues. Former PC leader Patrick Brown (who resigned when accused by anonymous women of sexual “misconduct”) had already introduced the PC’s 2018 Election Platform, which offered a number of new spending items (including tax credits for the purchase of snow tires, dentistry subsidies etc. ), all funded by a federal carbon levy. However, all of the candidates to replace Brown oppose the levy, which was widely recognized to raise the question of how the PCs would pay for the billions of dollars in new spending set out in their 2018 election platform (a point echoed by Matthews during her interview with Lawton). Accordingly, after discussing the (in)competency of the PC leadership candidates, Lawton focused primarily upon the issues of resolving the problem with the PC platform, and of balancing the the Ontario budget. McKeever gave an example – drawn from Freedom Party’s numerous Opposition Budgets – of how the budget could be balanced while improving access to healthcare in the province. You can listen to the March 1 debate, to Lawton’s interview with Matthews, and to Lawton’s interview with McKeever, below. Paul McKeever and Robert Metz on Just Right: What is the alternative to the Liberals? On February 23, 2018, Freedom Party leader Paul McKeever and Just Right host (and Freedom Party of Ontario president/CFO) Robert Metz discussed what makes Liberal governance Liberal, and what an alternative to the Liberals requires. They discussed how replacing the Ontario Liberals with Ontario’s Progressive Conservatives would not cause any substantive change at all to the governance of the province. Topics include what the Liberals have done to Ontario over the last 15 years of their rule; the bigoted, socialist history of Ontario’s Progressive Conservative Party; and a comparison between how life in Ontario would be in 2022 if, in the June 7, 2018 provincial election, Freedom government were elected instead of a Progressive Conservative government. 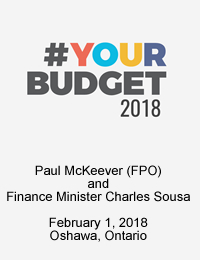 On February 1, 2018, Freedom Party of Ontario leader Paul McKeever testified at the Oshawa hearing of Finance Minister Charles Sousa’s Pre-Budget 2018 Consultations. Before submissions commenced, each of Sousa and Dickson gave opening remarks. The attendees were told that, thereafter, submissions were to be made back-to-back, with no debate in between, so that everyone would be heard. The meeting was scheduled to last only 1.5 hours: from 9:00 AM until 10:30 AM. The first to make a submission was Adrian Foster, the Mayor of Clarington. 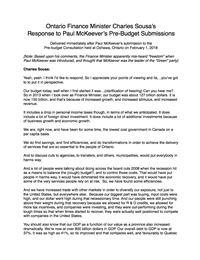 Paul McKeever commenced his submissions immediately thereafter, essentially focusing upon 4 ways not to balance a budget. Apparently, McKeever’s submissions landed a blow because, as soon as McKeever finished, the Finance Minister indicated he wanted to make a response to McKeever’s submissions. This recording includes both McKeever’s oral submissions and the Finance Minister’s response. 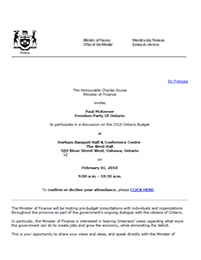 Ontario’s 2015 Budget was released at 4:00 PM on Thursday, April 23, 2015. At approximately 3:45 PM, on The Live Drive program (NewsTalk 1290AM CJBK, London, Ontario) with host Andy Oudman, Paul McKeever, leader, Freedom Party of Ontario, was interviewed about the Budget, and the governing Liberal party’s 12 year track record.